I hate to say it, but today I spent most of the day working on setting up a new washer and dryer. 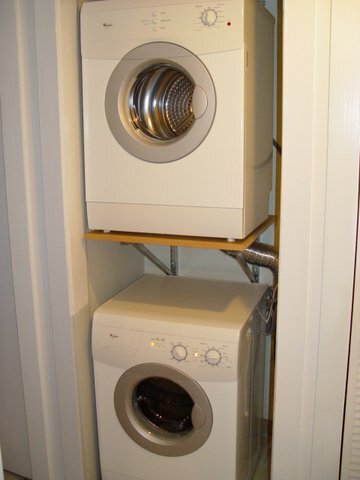 It's not that the actual process of connecting a new washer and dryer takes very long - that's pretty simple, just connect two water hoses, a drain pipe, and the dryer exhaust and you're good to go - but I decided to do some closet modifications. The previous washer and dryer was one of those stacked all-in-one combo units. As can be seen in the picture, the new washer and dryer are separate units. Since the washer has a very high speed spin cycle, I decided to build a separate shelf for the dryer so it wouldn't get bounced around sitting on top of the washer. The shelf was easy enough to build although it was a bit time consuming. The tricky part was getting the dryer up on the shelf by myself without hurting my back. The old washer/dryer was a bit too big for the space so a closet door wasn't an option. Now I ought to build a door. I find the spinning clothes in the little windows hypnotic and end up lost in time watching the clothes go 'round and 'round.